With the non-continued recipes option, if a recipe will not fit completely on the remainder of a page, it will begin on the next page. There is an extra charge for the non-continued recipe feature due to the increased number of pages added to each book. This feature is standard with the Ease-L-Back format. 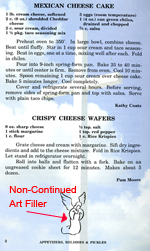 Continued Recipe Option— Most cookbooks published by Fundcraft have recipes continue onto the next page. This uses the maximum space on each page, resulting in a savings passed on to the customer. Even with the continued recipes option, your recipes will be presented in a professional fashion - no recipe heading or single ingredient will be printed alone at the bottom of a page. The continued recipe option is included in the base price of your book. When non-continued recipes option is selected, a blank space will be left at the bottom of some pages where there was not enough room to fit the entire next recipe. For an additional charge, you may choose to fill this space with art fillers or text fillers. Fundcraft offers four sets of filler quotations and five sets of filler artwork. Each set contains 40 - 80 quotations or pieces of artwork. Art and quotation fillers cannot be mixed. You may also choose to submit your own custom artwork or quotations. Custom fillers are a great way to add a unique touch to your cookbook. Custom art can allow every member of your group a chance to contribute to the creative aspect of your book. Custom text can be used to scatter historical information or facts throughout your cookbook. Custom art and quotation fillers cannot be mixed. *Note: that custom art fillers will be reproduced in black and white and should be line art only, no grayscale or screens. A good rule of thumb is if the artwork will photocopy well, it is suitable to be used as a filler. Custom art fillers should be designed no larger than 2" high by 4" wide. We will size the art to fit the available space. Custom text fillers should be submitted typed or printed neatly. Do not submit them on the same sheets as the recipes but on separate sheets. Fillers will be inserted as space permits in random locations throughout the cookbook and cannot be placed with specific recipes. Submit roughly one filler for every three recipes, and while we will make every attempt to use every filler, we cannot guarantee this. Quotation Filler Set of Four Text Fillers— Food Quotes, Motivational Sayings, Bible Scriptures and Cooking Tips. When you are making meatballs or dumplings, oil your hands first to prevent sticking. Pie dough will keep in the refrigerator for up to three days or in the freezer for up to six months. Attach canning labels to the lids instead of to the jars to prevent the chore of removing the labels when the conents are gone. To a cutting board of onion, garlic or fish smell, cut a lemon in half and rub the surface with the cut side of the fruit. 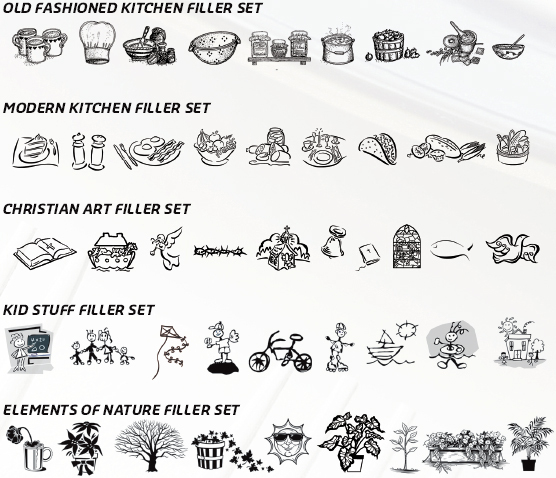 With five different Fundcraft art filler sets: Old Fashioned Kitchen, Modern Kitchen, Christian Art, Kid Stuff and Elements/Nature. You can add a unique touch to your cookbook.